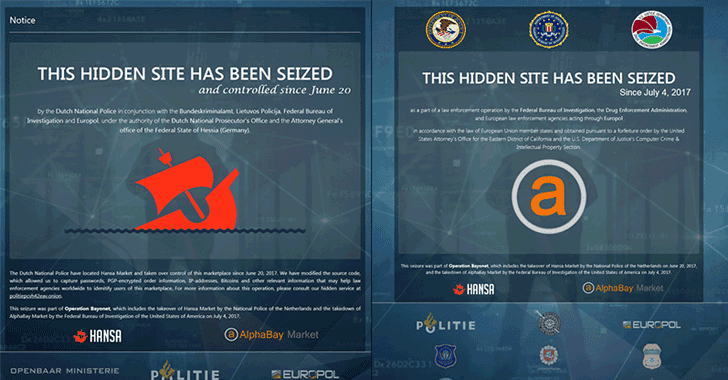 It's finally confirmed — In a coordinated International operation, Europol along with FBI, DEA (Drug Enforcement Agency) and Dutch National Police have seized and taken down AlphaBay, one of the largest criminal marketplaces on the Dark Web. But not just AlphaBay, the law enforcement agencies have also seized another illegal dark web market called HANSA, Europol confirmed in a press release today. According to Europol, both underground criminal markets are "responsible for the trading of over 350,000 illicit commodities including drugs, firearms and cybercrime malware." On July 4th, AlphaBay suddenly went down without any explanation from its administrators, which left its customers in panic. Some of them even suspected that the website's admins had pulled an exit scam and stole user funds. However, last week it was reported that the mysterious shut down of the dark web marketplace was due to a series of raids conducted by the international authorities. The raid also resulted in the arrest of Alexandre Cazes, a 26-year-old Canadian citizen who was one of the alleged AlphaBay's operators and was awaiting extradition to the US when a guard found him hanged in his jail cell the next day. Now, Europol just announced that two of the largest criminal Dark Web markets—AlphaBay and Hansa— have shut down by the authorities, as the infrastructure "responsible for the trading of over 350 000 illicit commodities including drugs, firearms and cybercrime malware." "This is an outstanding success by authorities in Europe and the US. The capability of drug traffickers and other serious criminals around the world has taken a serious hit today after a highly sophisticated joint action in multiple countries," Rob Wainwright, Europol Executive Director said. This is what made the operation more interesting. The federal authorities revealed that they secretly took control over the Hansa market on 20th June 2017 and kept it running for at least a month in an effort to monitor the activities of vendors and buyers without their knowledge. And here's the Icing on the cake — During the same period federal authorities purposely only took down AlphaBay, forcing their users to join the Hansa market for illegal trading and purchasing. "We could identify and disrupt the regular criminal activity that was happening on Hansa market but also sweep up all of those new users that were displaced from AlphaBay and looking for a new trading platform for their ciminal activities," Rod Jay Rosenstein, the Deputy Attorney General for the DoJ, said today in a live press conference in Washington DC. Cazes made the same mistake that most cyber criminals do which revealed his real identity and led to his arrest. He was using his personal email (Pimp_Alex_91@hotmail.com) to send out welcome & support emails to all members of his AlphaBay websites. The feds learned that the email address belonged to a Canadian man named Alexandre Cazes with the birth date October 19, 1991, and was working as president of a software company called EBX Technologies. "Law enforcement authorities in the United States worked with numerous foreign partners to freeze and preserve millions of dollars’ worth of cryptocurrencies that were the subject of forfeiture counts in the indictment, and that represent the proceeds of the AlphaBay organization’s illegal activities," the DoJ says. Prior to its takedown, AlphaBay Market reached more than 200,000 customers and 40,000 vendors, with over 250,000 listings for illegal drugs and over 100,000 stolen and fraudulent identification documents and access devices, malware and other computer hacking tools. Authorities believed that the dark websites like AlphaBay and Hansa were responsible for lost of many lives in America. "Today, some of the most prolific drug suppliers use what is called the dark web, which is a collection of hidden websites that you can only access if you mask your identity and your location," Rosenstein said. Like AlphaBay, Silk Road, the largest Dark Web market at that time, was also shut down after the law enforcement raided its servers in 2013 and arrested its founder Ross William Ulbricht, who has been sentenced to life in prison. The feds also seized Bitcoins (worth $33.6 million, at that time) from the dark web site. Those Bitcoins were later sold in a series of auctions by the United States Marshals Service (USMS).